Brink's Modern Internal Auditing: A Common Body of Knowledge, Eighth Edition covers the fundamental information that you need to make your role as internal auditor effective, efficient, and accurate. Originally written by one of the founders of internal auditing, Vic Brink and now fully updated and revised by internal controls and IT specialist, Robert Moeller, this new edition reflects the latest industry changes and legal revisions. This comprehensive resource has long been—and will continue to be—a critical reference for both new and seasoned internal auditors alike. Through the information provided in this inclusive text, you explore how to maximize your impact on your company by creating higher standards of professional conduct and greater protection against inefficiency, misconduct, illegal activity, and fraud. A key feature of this book is a detailed description of an internal audit Common Body of Knowledge (CBOK), key governance; risk and compliance topics that all internal auditors need to know and understand. There are informative discussions on how to plan and perform internal audits including the information technology (IT) security and control issues that impact all enterprises today. Modern internal auditing is presented as a standard-setting branch of business that elevates professional conduct and protects entities against fraud, misconduct, illegal activity, inefficiency, and other issues that could detract from success. 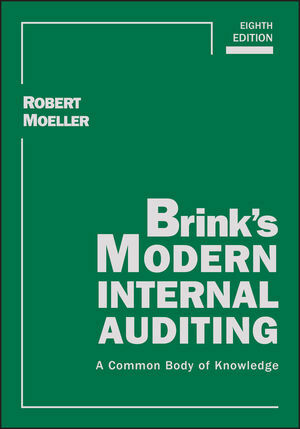 Brink's Modern Internal Auditing: A Common Body of Knowledge, Eighth Editionpresents the comprehensive collection of information that internal auditors rely on to remain effective in their role. Robert Moeller, CPA, CISA, PMP, and CISSP, has held multiple internal and IT audit leadership positions throughout his career, including directing internal audit functions for several Chicago area major corporations, managing the U.S. IT audit practice for Grant Thornton and launching the first IT audit function at the 'old' Sears Roebuck, when Sears consisted of their retail and catalog operations, Allstate Insurance, Dean-Witter financial, Discover Card, and Coldwell-Banker real estate operations. He then went on to assume overall responsibility for the overall Sears internal audit function.